The Hmong are scattered throughout many countries, including China, Laos, Vietnam and Thailand. Within Thailand they are found in many provinces, including Chiang Mai, Chiang Rai, Phayao, Nan, Phrae, Mae Hong Son and Tak. They belong to the Meo-Yao branch of the Austro-Thai linguistic group. 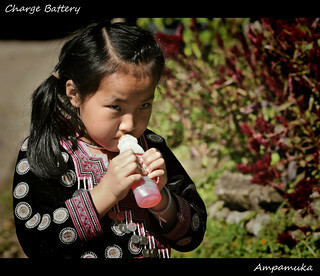 The Hmong are the second largest tribal group after the Karen. There are three subgroups of Hmong to be found in Thailand: the Blue Hmong (Mong Njua), the White Hmong (Hmong Daw) and the Hmong Gua M'ba. The White Hmong and the Hmong Gua M'ba are very similar, the latter have only been in Thailand for a few years (they came across the border from Laos). The White Hmong women wear indigo trousers on most occasions but have a white pleated skirt for special occasions. The Blue Hmong women wear an indigo batik design skirt at all times, the skirt having many many pleats. Hmong families are patrilineal and polygamy is allowed. After marriage wives move into the husband's house. The extended family is the most important unit in a Hmong village and after that the clan is most important. Clans are identified by their name and most villages normally have families from more than one clan. Marriage within the clan is not allowed. The Hmong prefer to set their villages at high altitudes of 1000-1200m and practice shifting cultivation. They will often move great distances in search of new and better land. Their primary crops are dry rice and corn with vegetables for cash crops. The Hmong worship their ancestors and many other spirits. The village priest and shaman are very important people in the village. Their ceremonies also show their close connections to Chinese culture. New Year, after the rice harvest is the most important ceremony of the year and you will often see the people wearing silver, which is a sign of wealth. The Hmong men are accomplished silversmiths.